With unemployment at an all time low and time to hire more important than ever, more HR departments are considering artificial intelligence to solve their bandwidth problems. 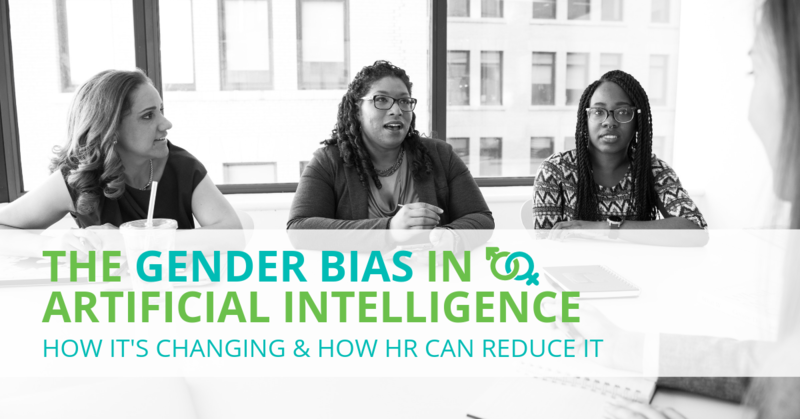 While AI may seem like the ideal solution for an overloaded HR department, there are actually many examples of gender bias. According to McKinsey & Company, many companies already know that stronger diversity leads to stronger business. So how do we achieve unbiased AI solutions for HR? Let’s start with the service providers themselves. In order to keep time to hire low, recruiters are turning to artificial intelligence. It’s why according to the Deloitte Human Capital Trends Report, 38 percent of companies are using artificial intelligence (AI) in their recruiting. However, there’s an issue with the data that’s going into the AI in the first place. In an interview with SHRM, Stephanie Lampkin talked about algorithmic biases, in which companies use resume filters or candidate rating systems that are biased against women. The main issue is that AI is only as good, and unbiased, as its developers are. Since AI can’t consider social context or ethical fairness in an algorithm, it oftentimes misses the mark. When Amazon caught wind that their AI tool was penalizing female candidates, they reprogrammed it to ignore gendered words like “women’s”. Soon after they found that even implicitly gendered words such as “executed” and “captured” (which were highly correlated with men over women) were being used to penalize candidates as well. AI is a constant work in progress and can’t know what it’s programmers don’t program it to know. According to the World Economic Forum’s Global Gender Gap Report, only 22% of AI professionals in the world are female. And in a field where perspective and problem solving diverse situations is critical, the more women who work in AI, the more unbiased HR software will be. Find HR technology companies lead by a diverse staff. Ask your companies where they get their data to teach their AI programs. Test the different AI programs, and see how results differ. AI has a long way to go before it’s perfect, but in the face of new hiring challenges, it may be a viable consideration for sparing your HR team’s bandwidth. Before requesting an AI platform for you hiring needs, do the due diligence to make sure you’re avoiding any potential bias. It could make all the difference in choosing the right candidate. Ultimately, what leads to unbiased hiring is objective information, like background screenings. To learn more about how background screenings can reduce hiring bias, contact Verified First.